With plenty of available spectrum, this unlicensed band works well for long‑distance links. The Rocket5ac Prism features full-band 5 GHz coverage and maximizes output power for the US market, meeting strict OOBE requirements. Use the real-time spectrum analyzer so you can identify noise signatures and design your wireless links to minimize noise interference. To take full advantage of its design and capabilities, deploy the Rocket5ac Prism for PtP or PtMP links in high RF noise environments. You can mount three Rocket5ac Prism radios on the airPrism 5 GHz 3x30° HD Sector Antenna, model AP‑5AC‑90‑HD, for PtMP links. Each Rocket radio corresponds with a specific 30° beamwidth and independently transmits and receives. Helps protect the Rocket5ac Prism against electromagnetic interference. (PoE) 24V Passive PoE functionality is included. Both power and data are carried over a single Ethernet cable to the Rocket ac. Use the included PoE Adapter or an optional PoE switch. 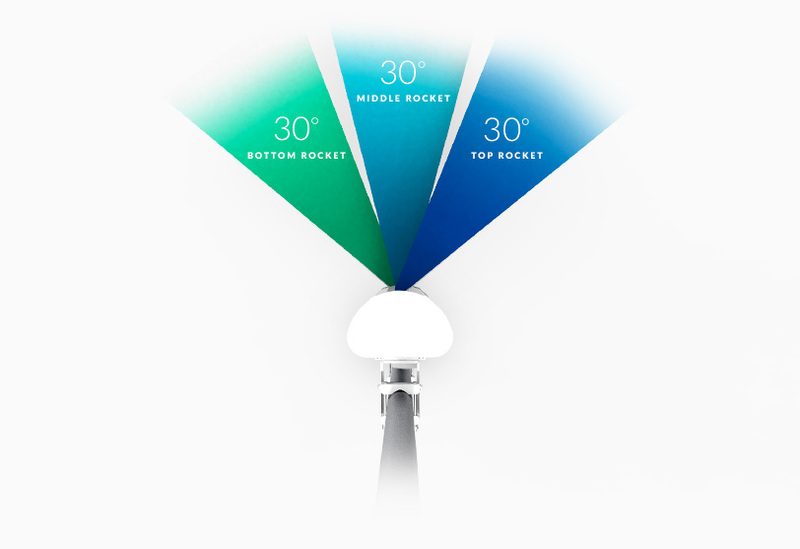 Every airMAX antenna has a built-in Rocket mount, so no tools are needed to install the Rocket5ac Prism. (airMAX ac antennas are recommended for optimal performance).